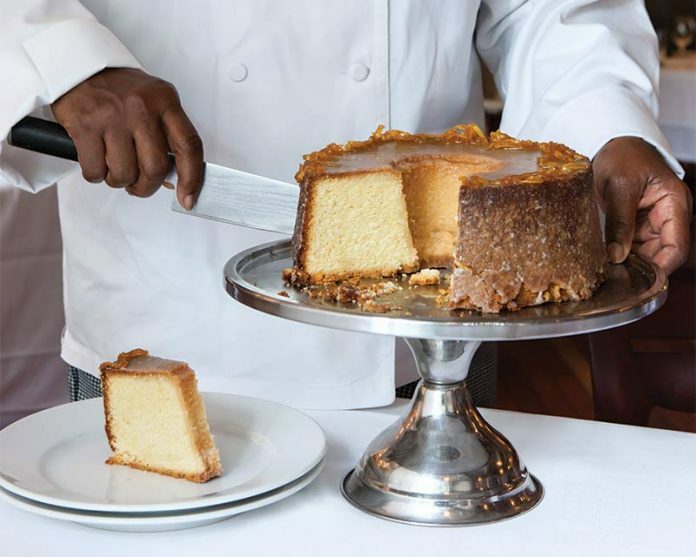 For a perfect pound cake, pastry chef Dolester Miles insists it’s all in how the ingredients come together. 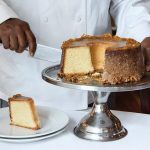 This recipe suggests creaming the butter and sugar for five minutes, but Dolester often lets it go longer—seven minutes or more—to make sure the mixture is nice and creamy before adding the eggs one at a time. Let ingredients come to room temperature for at least 20 minutes. Preheat oven to 325° F. Grease and flour a 10-inch tube pan. In a large bowl, beat butter with a mixer at medium speed until creamy, about 2 minutes. Gradually add sugar, and beat until fluffy, about 5 minutes. Add eggs, one at a time, beating just until combined after each addition. In a large bowl, whisk together flour, nutmeg, and salt. Gradually add flour mixture to butter mixture alternately with milk, beginning and ending with flour mixture, beating just until combined after each addition. Stir in zest and vanilla. Spoon batter into prepared pan. Bake until a wooden pick inserted near center comes out clean, 1 hour to 1 hour and 15 minutes. Let cool in pan for 15 minutes. Remove from pan, and let cool completely on a wire rack. Spoon Bourbon Glaze over cake. In a small saucepan, combine sugar, bourbon, and butter. Cook over low heat, whisking constantly, until butter melts and sugar dissolves. May I make this with Canadian or Scotch whiskey? Hi Joann, we’ve never tried this recipe with Canadian or Scotch whiskey, but our recipe developer thinks it would be an equal parts swap. The main difference you’ll notice will be in the flavor. Let us know how it goes! This looks Fabulous, I am about to make it right now. Wish me luck. I was searching for something yummy to make my honey for dessert. This is perfect. What type of bourbon do you recommend for the glaze ? Would Jim Bean be perfectly fine ? thank you for reaching out! Any bourbon will do- the Jim Bean one would be perfectly fine. Happy Baking! Can this be made in a bundt pan? Hi Elizabeth! Although we have not tested this cake in a Bundt pan, you can make this into a Bundt cake! We just would recommend you pay extra attention to the cook time as it will vary. Happy Baking!